スレ主：I found it on some Italian site I was lookin for some good pics of D-Heros and found this. 人物Ｂ：Thats a pic made by some kid. I saw it in a issue of Beckett or something. スレ主：O.o Wierd it looks very real to....Fooled me. 人物Ｄ：Kinda. This card is in fact real. It's One of a Kind also. The kid, Tyler was his name. He had some disease, and there was an organization that would grant him a "wish" if you will. He wanted his own Yu-Gi-Oh! card, custom made. He got it. 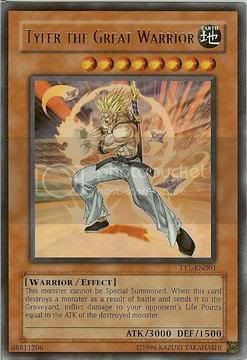 The picture is Super Sayajin Trunks, of DragonBall Z. I'd imagine that this card is kept on serious lockdown, as it is most likely priceless. The only one of it's kind. 人物Ｄ：That seems like a pretty high chance. 3/4 that you thought it would be fake.